Chuck Taylor’s distinctive signature is emblazoned across millions of ankles worldwide; this is the story of the man and the canvas sneakers he’s synonymous with. Chuck Taylor in his later years. Compared to today’s top basketball shoes, sneakers that look more like technological marvels than footwear, the Converse Chuck Taylor All Star basketball shoe looks almost primitive. A rubber sole, a canvas top. That’s it. No lights in the heels, no air pumps, just white laces and a rubber toe cap. While basketball was evolving through its “cage” years (from the turn of the century in the late 1920’s most professional basketball games were played in enclosed wire or rope cages), their shoes were also evolving. According to Robert W. Peterson’s book “Cages to Jump Shots,” the earliest ballplayers wore a standard gymnasium shoe — a hi-topped leather-soled shoe. By 1900, A.G. Spalding had developed the first “basketball” shoes — a canvas hi-top with a pitted rubber sole for traction purposes. Meanwhile, the Converse Rubber Shoe Company, on the strength of its early products — namely rubber boots and automobile tires — was establishing itself in the marketplace. By 1917, after successfully developing a canvas-topped tennis shoe, Converse created the “All Star,” its first basketball shoe. Sales were slow at first — Converse not only had to compete with Spalding, but also with tire companies U.S. Rubber and Goodrich, who were also entering the athletic footwear market — but the company persisted. In 1921, Converse hired a former athlete to help sell its shoes — Charles “Chuck” Taylor, a pre-World War I high school basketball star who later barnstormed with several teams, including the Original Celtics and the Akron Firestones. In 1921, Taylor went to Converse’s Chicago office in search of an offseason job, and was hired by salesman Bob Pletz, a sportsman who was looking for athletes to help improve the company’s canvas sneakers. Chuck Taylor’s signature still appears on the inside patch of every high top Chuck Taylor shoe. During World War II, while Converse was making the A6 Flying Boot for the Air Force, Chuck Taylor continued to promote the All Star sneaker among the enlisted men as a fitness consultant to the United States Armed Forces. To this day, the All Star is still defined in the military supply system, and is covered by Military Specification MIL-S-43961. National Stock Number 8430-00-257-3759 is still a size 12 unbleached canvas low-top. After World War II, Converse received more support in promoting its basketball footwear, this time from the Phillips Oilers traveling squad. Grady Lewis, an AAU All-American with the Oilers, joined Converse’s Chicago sales team. He immediately started direct communications between Converse and high school coaches (many of whom were history professors waiting for Chuck Taylor to drive through with a clinic), and in the end, Converse All-Stars became de rigeur for the local hoops squads. In the 1970’s, Converse found a new way to advertise their sneaker — by placing it on the feet of the NBA’s top players, who in turn would endorse the shoe. Julius Erving became Converse’s first pro pitchman in 1975, promoting Converse’s new line of performance footwear (today, Dr. J is a member of the Converse board of directors). When the corporation added Magic Johnson and Larry Bird as spokespeople in 1981, Converse benefitted from the duo’s fierce basketball rivalry, as well as their superior talent on the court. Converse even placed both men in a “duel at dawn” pose for print ads promoting the company’s new “Weapon” sneaker in 1986. But by this time, Converse was losing the battle to remain the dominant basketball shoe. Other companies began making inroads - adidas and Puma in the 70’s, Nike and Reebok in the 80’s. Imported sneakers were now cutting into Converse’s profits, and the company lost $70 million in sales between 1973 and 1978. Changes needed to be made, and fast. Converse consolidated most of its New England operations, closing most of its plants and moving production of its most popular sneakers to a new facility in Lumberton, North Carolina. Converse manufactured chucks and other shoes at its Lumberton, NC plant until 2000. By the mid-80’s, Converse was literally back on its feet. Buoyed by a successful run as the official shoe company of the 1984 Los Angeles Olympics, and with its superstar sports people Johnson and Bird winning NBA titles, Converse flourished. In 1991 the company signed Larry Johnson as a spokesperson, and his series of gender-bending “Grandmama” commercials became an integral part of Johnson’s persona. As Converse heads into the new millennium, it still reaches back to the past for its superstar endorsements. Julius Erving now pitches the “All Star 2000,” a performance shoe with the advertising catchphrase: “Take the soul to the hole.” Converse has also run a series of commercials with Dennis Rodman, and has signed four of the top NBA picks from last June’s draft to shoe contracts. Converse hasn’t forgotten its Chuck Taylor model. Although an NBA player wearing chucks on the court is about as rare as a Yinka Dare assist, the shoe has found a new home in the “extreme sports” world. Many professional skateboarders and trick cyclists prefer the Chuck Taylor over more expensive and cumbersome sneakers, and have exposed the shoe to an entire new audience. Also, All Stars have been embraced by the culture at large. “Chucks” have been prevalent in the world of alternative music from the safety-pin-pierced punk rockers of the late 70’s to the flannel-shirt-clad grunge rockers of the early 90’s. The Chuck Taylor sneaker has also spawned its own collector’s clubs, as hobbyists search out rare colored sneakers, early models (shoe boxes intact, of course) and the scarce 1986 “ultra-hi-top,” which could be laced up to the calf. Converse has built its own website, but other shrines have popped up over the years. Charlie’s “Chuck’s Page”, for example, has vintage photos of chucks and shoe boxes, plus personal recollections from those who wore — or still wear — the sneakers. 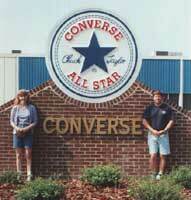 By the year 2000, Converse predicts its Lumberton plant will produce the 600 millionth pair of All Stars. It will still look the same as today — a canvas top, a rubber sole, a rubber toe, and an ankle patch with the autograph of a man whose playing stats Michael Jordan can surpass in a single week. But without Taylor’s persistence, the shoe may never have reached its millionth pair. Like a basketball Johnny Appleseed, Taylor planted canvas-topped, rubber-soled seeds in the fertile minds of future basketball superstars. His name was prominent when Converse named college basketball stars to its “Chuck Taylor Converse” All Star team from the 1930’s to the early 1970’s. 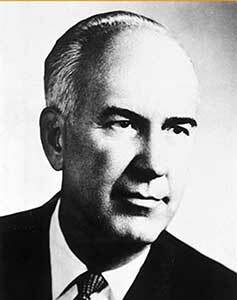 Taylor was later elected to two halls of fame for his work with Converse — the Sporting Goods Hall of Fame in 1958, and the Basketball Hall of Fame as a contributor after his retirement from Converse in 1968. Taylor passed away in 1969, but his legacy endures — on the vinyl ankle patches of countless pairs of canvas sneakers. and the author of Warman’s American Records 1950-2000. * Editor’s Note: Converse now manufactures Chuck Taylor All Stars and all of its shoe products in Asia.